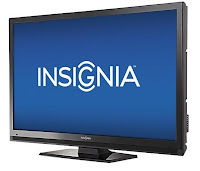 Today only Best Buy is offering this Insignia 50" Class LCD 1080p 120Hz HDTV for just $400 . They retail this thing for $700, and that's not including the FREE shipping. This TV got great reviews on their site, which is important when you purchase something this majestic. Catch a flick in hi-def, play Call of Duty with clean graphics, or do what my buddy does and connect your laptop up to it. That's a lot of TV (and pixels) for the price.